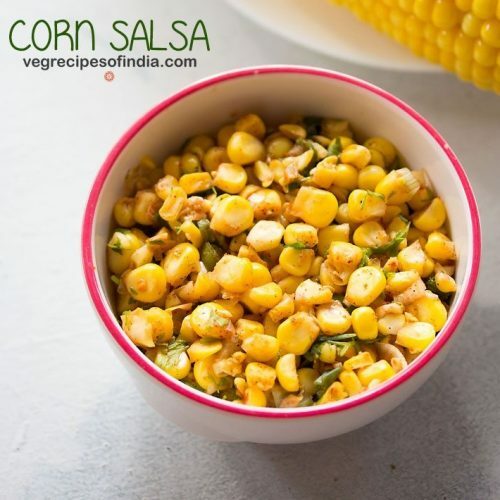 corn salsa is a tasty, tangy and spicy salsa made with sweet corn. in a pressure cooker, take 1 medium to large corn cob. add water almost covering the corn cob. pressure cook for 4 to 5 whistles or till the corn is steamed well. you can even steam the corn cob in a pan. when the corn cob cools down, then carefully with a knife slice off the corn kernels. you will need 1 cup of steamed corn kernels. now in a bowl take the corn kernels. also add ¼ cup finely chopped onions or spring onions, 1 green chili (chopped) and 2 tablespoons chopped coriander leaves. next add ¼ teaspoon cumin powder, ¼ teaspoon red chili powder, ¼ teaspoon black pepper powder and salt as required. serve corn salsa with nachos or crackers. you can add the green chilies or spice powders less or more as per your choice.